A 'Team Shelby' Fundraising Page: Shelby's Christmas Raffle! Hi everyone! JD and Max here! Now, as you're probably all aware Miss Shelby is doing so much better now that her beautiful babies have moved onto the next stage in their lives - click here to read more about their exciting journey! Beautiful and brave Miss Shelby! However, Miss Shelby still needs a lot more TLC which sadly for her will mean more visits to the vet, more medication and more treatment - all of which obviously comes with a price tag. We all want Miss Shelby to recover completely - it would be awful for her to have come this far and not make it all the way! 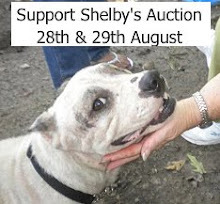 We were very proud to host the auction for Shelby in August and were delighted to be a part of everyone coming together to help raise money for this special girl. So we had an idea about throwing a Christmas raffle for Shelby too! This obviously won't be on the same scale as the auction as we'll only be raffling 4 prizes in total - but we really hope you'll join in as it's going to be LOTS of fun and you could end up with something REALLY GREAT for just a few dollars!! 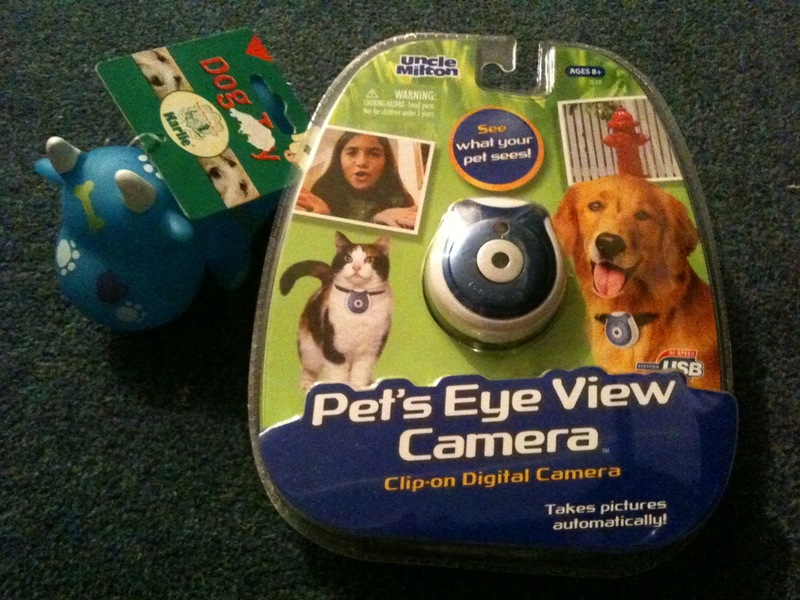 Pets Eye View Camera and Squeaky Dog Toy! We love this camera and want one!! FH also decided to 'throw in' a fab squeaky cow doggie toy with this item - we're not sure why but we want the doggie toy too!! Anyhow, here's the blub on this pawsome item - "When you’re sitting at work, we all reckon that the dog has a better life. Until now, there’s been no way to find out if this is actually true, or just the ramblings of stress. Does your canine pal spend the day napping on your armchair, or is he firing up the Xbox and slaying space marines, drinking your beers and calling in rabbit pizzas? OK, so the last bit is probably the stress talking. But don’t you want to know for sure? The Pet’s Eye View Camera is how you find out. The internal memory can store up to 40 snaps, so you’ll have a whole album’s worth of memories to share with your friends. Although you might want to edit out the less hygienic ones for public consumption. Best of all, the shots blow up to 6” by 4”, perfect for framing and putting on the mantelpiece. Or even turning into Christmas cards for your family, just as long as your family love the sight of an upturned bin and a dog’s tongue scooping out the last flecks of custard from the packet. Compatible with Macs and PCs, the Pet’s Eye View Camera links to your computer with a USB cable for simple downloading, and contains a rechargeable battery for endless photographic larks." 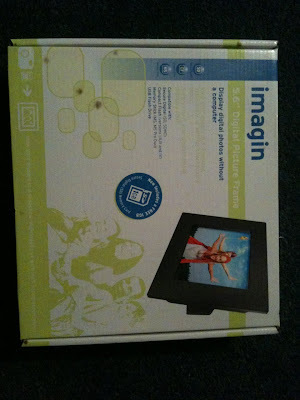 This would be a cool gift to win for your humans - a 5.6" digital photo frame (sorry for the photo being on its side - it kept on flipping back whenever we tried to rectify it!). 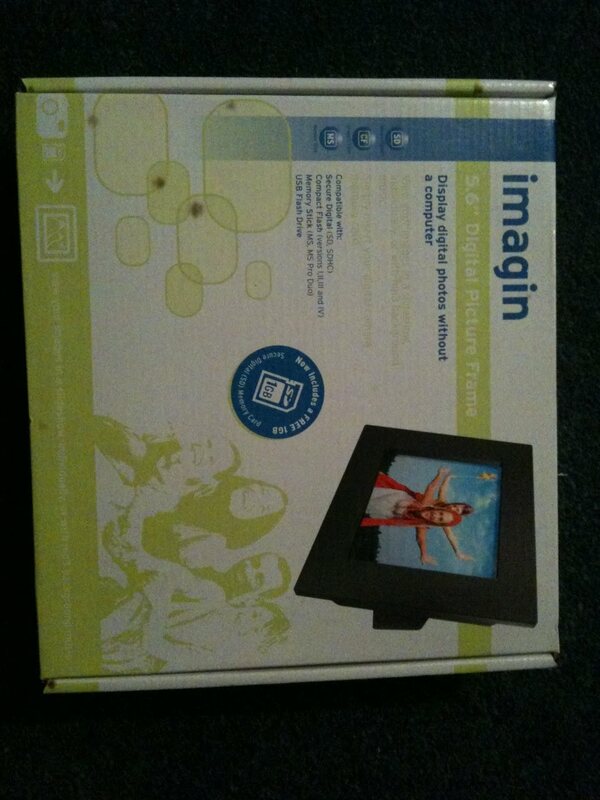 There's not much more we can say about this really as everyone knows what a digital photo frame is - he he he! Oh, but it does also come with a 1gb flash card - that'll hold about 600 photos so that'll be MORE than enough images of yourself to thrill your humans with! Now THIS is brilliant! Do you remember the pawsome octopus stuffie our good pal Lily the GSD got for JD when he had surgery on his paw? Well, that octopus was tough (it's still in one piece many months on, even after being chewed, buried and enduring many games of tug between the two of us!!) and that was the 'baby' of the family. It's still JD's number one favourite toy! 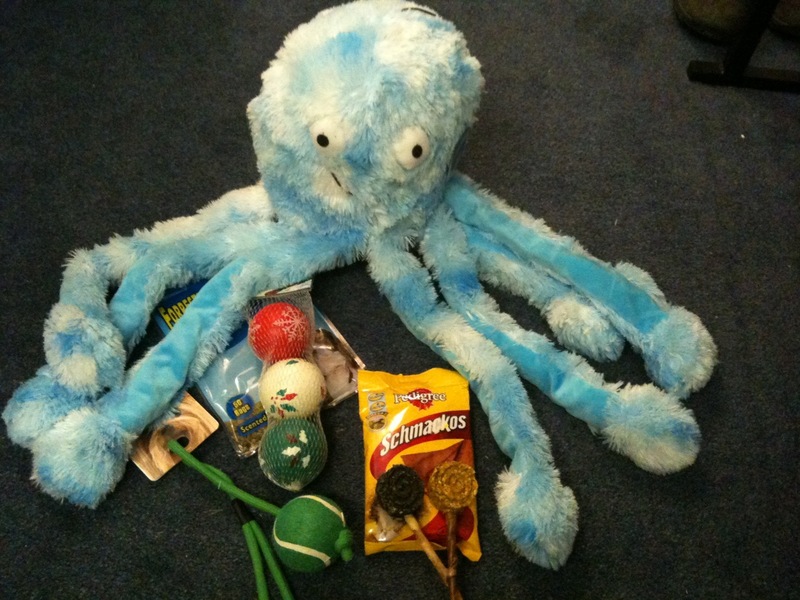 Well, THIS doggie treat package comes with the DADDY octopus - and when we tell you it's big we mean BIG! Take a look at the photo below and you'll see that it's even bigger than us two! This octopus has a squeaker in every other tentacle, a big squeaker in its head and each tentacle makes a delightful 'scrunchy' noise - trust us, this is a pawsome toy! This treat package ALSO contains a pack of 3 festive balls, a tennis ball on a rope throw toy, a pack of 50 environment friendly bio-degradable poop bags, two yummy lollipop treats and a pack of Pedigree Schmackos! We know ALL you pups out there will be hoping to win this item! Now THIS is ALSO brilliant! 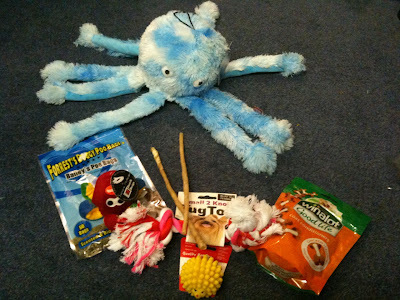 THIS doggie treat package comes with the MUMMY octopus - and the mummy ain't exactly tiny either, he he he!! 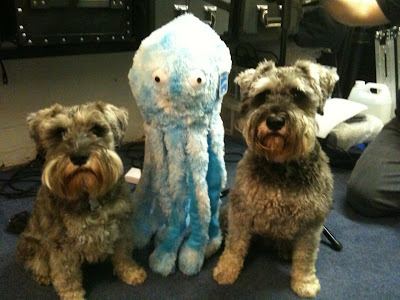 Take a look at the photo below and you'll see that this is one cool stuffie! As with the Daddy octopus the Mummy has a squeaker in every other tentacle, a big squeaker in its head and each tentacle makes a delightful 'scrunchy' noise! This treat package ALSO contains a rope bone, a small squeaky octopus toy, a small yellow hedgehog toy, a pack of 50 environment friendly bio-degradable poop bags, two yummy thin but extra long raw hide chews and a pack of Winalot coat conditioning treats! We know ALL you pups out there will be hoping to win this item too! Now, we've supplied the frame prize, the pets eye view thingy and the octopus toys but we'd also like to say a HUGE thanks to our good pal Lily the GSD and her human Jo - Jo has a pet store which is pretty cool, but what is REALLY cool is that when Jo found out we were going to be holding this raffle she kindly donated ALL the other items that are included. That is what we call generous! Beauty and kindness all rolled into one - that's our pal Lily! So, now you've seen the prizes chances are you'll want to buy loads and loads of tickets! So you'll obviously want to know how to do just that - well, that's easy peasy! Tickets are $2.00 each and there are 2 ways you can purchase a raffle ticket. You can either donate via the PayPal button on the right hand side of this blog page OR you can send a check via Mona and her Mommy. If you want to send a check please e-mail Mona at redriccaATsbcglobalDOTnet and she'll make all the necessary arrangements with you. If you want to pay via PayPal then simply click on the donate button and leave your donation - it couldn't be easier! We wanted to buy more but FH told us we had to limit ourselves a little so this list is much shorter than we'd like it to be - humph! So come on everyone - what are you waiting for - grab yourselves some tickets now!! Ohhhh Fank yu so much fer doin dis and fer buyin me 'n' Ronnii a ticket. Yu guys arr most pawesome indeed. I will be makins sure everryone knows abouts dis. WOWZA! Those are some super amazing terrific prizes! And you two are super amazing terrific boys! And your FH is, too. Well, not a boy...but she's super amazing terrific! And so is Lily! OH! And thank you, thank you for buying me a raffle ticket! Gosh, I'm just overcome with how Most Wonderful all this is. I'll be sure and puts this on my bloggie this week. I hope lots and lots of furends join in! Oh, JD and Max, you guys and your FH are so nice to do this. Thank you for buying us a raffle ticket. oh, and me and asa wanna woof a super thankie to ya'll for buyin' us a raffle ticket! that was very sweet of you! This is AWESOME!!! Just like you two!! I will go dig out mom's plastic number card....ummm I mean go ask mom to go buy some raffles tickets right now! We love the idea of buying tickets for our friends! What a great idea! Thank you for hosting another auction and for buying a ticket for us. We're off to buy some tickets now! Hi you two! 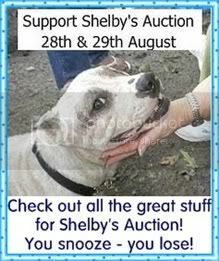 We've just joined your blog - we are blown away by the wonderful effort you are putting in to help Ms Shelby. I keep getting an error message (it's my computer, not your blog) so I'm not sure if my other message went through or not. Thank you so much for helping Shelby. She's been through so much. I just want her to be happy and healty again. There's another dog who needs help too. He's also a pit bull and he had heartworms too. His name is Skeletor. I'd like to do something like this for him but I was wondering how you put this all together. I wouldn't even know where to begin?! We are buying tickets for all of our furiends...or as many as we can afford before the auction ends. We will send money as we can to get more tickets. You guys and your friend Lily are the bestest. Shiloh'n Shasta here - We r gonna git our mom tu buy a few ticketz. Also, we tried tu follow this blog but the button wantz us tu sign in tu follow an'we r signed in - try agin later. 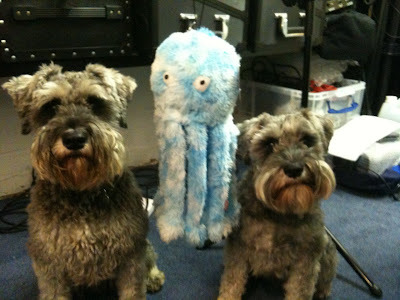 Minnie says she wants the Giant Octopus Stuffy!! It was a hard choice - but i have to get what Minnie wants! Thanks for letting me know we won!! Well, now I'm being told that we're 4th place winners and not 1st place, so please send us whatever is left when the winners pick theirs. Please excuse us. I made a mistake. Trixie and Minnie were the 1st place winners. My apologies. Yup - Trixie and Minnie who own Barbara came first! We've only just got to know them so we're thrilled about this! 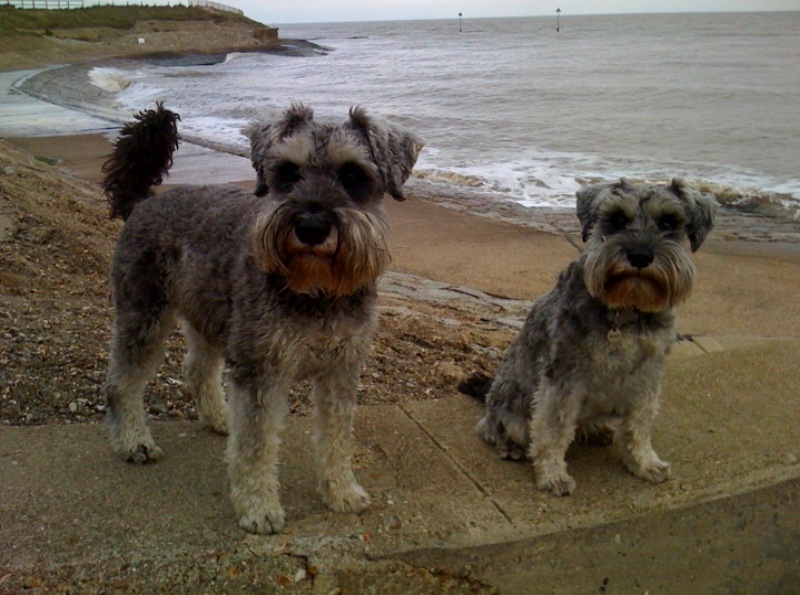 Trixie and Minnie have trained their human so well - Barbara is helping with Blueberry's auction, she's the person who set up the 'chip in' account and they've donated a pawsome item to be auctioned (there's already a small bidding war over it!) - so we couldn't be more thrilled that they got first prize here! FH and MH came home a little early from London (they were missing us too much, he he he!) so we're gonna be doing the post about the draw very soon. We've got some great photos and have documented every stage of the draw - it was so much fun! We'd like to thank everyone who took part - the main thing is that we raised green papers for Shelby and we're hoping everyone enjoyed it as much as we did. Huge schnauzer snuggles to everyone - JD and Max.